"Fate has more in store for me than I thought." 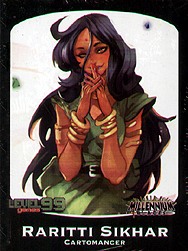 Raritti has a set of Fate Cards that give her a variety of bonuses as the Duel progresses. She relies heavily on these bonuses for her success. She cannot fully control which bonuses she gets when, but has a set of tools in her kit that give her some control over what Fate deals her. Find order in chaos and let Fate guide you to victory!